Unfortunately, floor failures are going to occur especially in today’s building environment. Every building project is time-pressed, so there are going to be a number of judgment calls that will be made regarding materials, scheduling and “bottom-line” decisions, and often, time & budget are traded for potential long-term liability issues. However, the stakes are higher than you might think when compromises are made due to deadlines. When a floor failure occurs, it can become a costly endeavor for the architect, contractor, flooring professional or homeowner. ITAC International is a professional firm which provides an unbiased forensic analysis of flooring failures. Our firm is built the old-fashioned way, with trust, honesty, and integrity. ITAC International’s expertise is in all facets of flooring from hardwood, tile, stone, vinyl products, and carpet, to applied coatings and finishes. Our knowledge of physics, applied science, and available resources makes ITAC International one of the most qualified firms in the flooring industry. ITAC International is an independent, third-party, walkway auditing firm providing professional comprehensive walkway surface analysis to residential & commercial facilities. Slippery surfaces, improper footwear, inadequate hazard identification, insufficient training, inattentiveness, construction deficiencies, claimant physiology, and fraud are among the many underlying reasons for slip and fall claims against property owners. The classic slip and fall claim alleges building-related deficiencies that caused the slip or fall event to occur. The claims professional is faced with the examination of the premises and the determination as to the validity of the claim to initiate the investigation. An analysis of the premises is a cost-effective first step. Measurements of critical dimensions, frictional aspects of the stairs or floors, lighting levels, and coefficient of friction (COF) testing, all yield factual information needed in slip and fall events. Three major ingredients of the slip and fall events revolve around the friction between the floor and the claimant’s shoe, the physical configuration of the accident scene, and/or lighting of the scene. Coefficient of friction/slip testing of surfaces is utilized when a slip and fall accident is investigated. For this purpose, we utilize up-to-date and current tribometers that meet recognized industry standards, such as the BOT 3000E, to determine the traction provided by a walking surface. The BOT 3000E can measure both static and dynamic coefficient of floor friction on a variety of test sliders in both wet and dry conditions. The tribometer is highly mobile and can be taken to the actual location of the slip and fall event where other environmental conditions can be reproduced and tested as well. We recommend being proactive before slip and fall events occur. Walkway surfaces should be periodically monitored for any possible changes to the surface due to daily usage over time. Whether you are taking a proactive approach or your have experienced a slip & fall event, contact us to discuss your needs. All floor covering and applied coating manufacturers will not warranty their products from moisture related failures. Most if not all specify that concrete substrates, regardless of age should be tested for moisture & alkalinity before being installed. Certified testing is a fraction of the cost of replacing a failed floor. Moisture can be introduced into flooring system from everything from leaking plumbing to a natural disaster, and it is also important to recognize the most subtle sources of moisture as well “naturally” occurring moisture in the concrete slab. Understanding how moisture interacts with the flooring material selected is the foundation of a successful installation. When a flooring system fails due to moisture-related problems, the first necessity is to locate the source of moisture, which may require additional testing depending on the findings, and the best line of defense is accurate moisture testing. 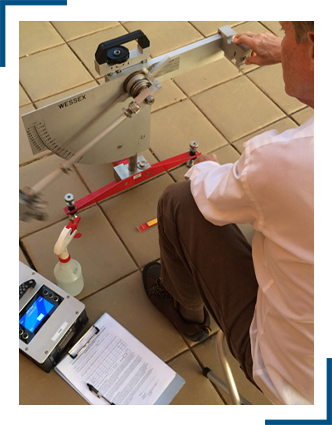 ITAC International is one of the leading firms in concrete moisture testing. ITAC utilizes current standards and testing protocols. 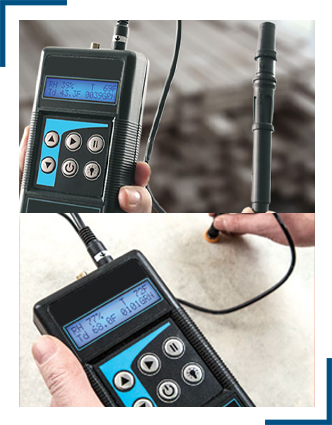 Our equipment meets current OSHA silica requirements, and use the most up-to-date testing equipment in the industry. 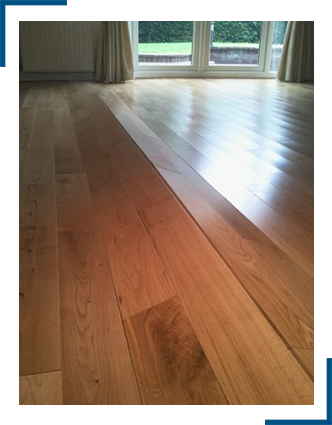 Whether you are taking a proactive approach or your flooring system failed, contact us to discuss your situation. 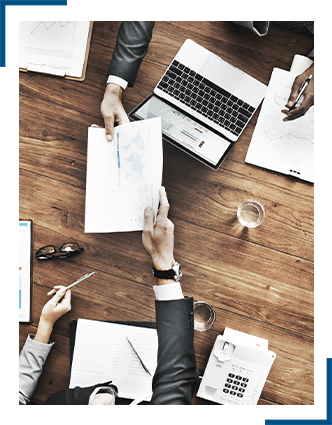 ITAC International’s consulting services focus on our clients’ most critical issues and concerns. ITAC takes a proactive approach before a floor fails or a slip and fall event occurs. We bring deep, functional expertise to the industry. With the advancement in modern flooring, such as engineered floors, pre-finished floors, luxury vinyl floors and advanced locking systems, there are failures occurring today that we did not have years ago. The same goes with the surface texture of these new products, as some products can become slippery when wet causing slip and fall events to occur. Our consulting services bring value to any organization’s project or preventative plan of action, with coefficient testing of surfaces, design consulting, project management, quality assurance inspections, specification development, document review, and floor failure prevention. Contact us to discuss your concerns or needs and let ITAC International assist you.